A very popular set up for chemistry in flow involves mixing Ts bringing reagents together to react in a coil reactor typically comprised of 1/8-inch outer diameter (or 1/16-inch inner diameter) tubing. Ideally, the T would be an effective mixing tool, but it is well known that this is not the case. The questions then are often: how far from ideal is it and will this adversely affect the process being developed? A third question asked, not often enough, is: how will this scale when increasing throughput via an increase in flow rate or enlarging the volume of the connected process (e.g. wider diameter coil reactors)? Here we show, through a simple reaction, the effect of volumetric flow rate on mixing in this typical set up. Figure 1 shows the two streams coming together. Each input stream is flowing at 0.02 mL/min each for a total flow rate through the 1/8-inch tubing of 0.04 mL/min. One incoming stream is pink. The other is colorless. A very fast reaction takes place when the streams mix and the result is a colorless stream. The point where the stream becomes colorless estimates the point where the streams have been completely-mixed. The incoming streams on both sides of the T are both the same solvent mixtures and each contains a separate reactant. The ruler is positioned with 0 cm at the junction of the two streams. At a slow flow rate the two streams flow together in a segregated or partially-segregated state after the T for approximately 4.4 cm (when observed from above, Figure 2). The same measurement was taken as flow rates were increased. This analysis was repeated for 1/16-inch outer diameter (1/32-inch inner diameter) tubing which is another popular dimension for flow chemistry development. 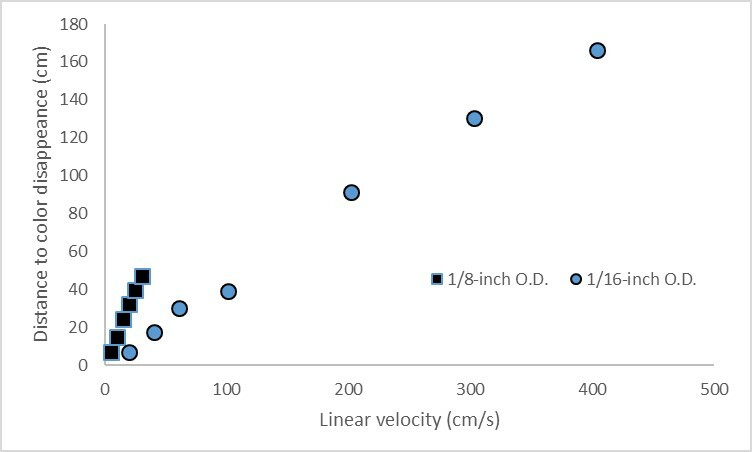 Results of mixing distance are plotted versus linear velocity (Figure 4). 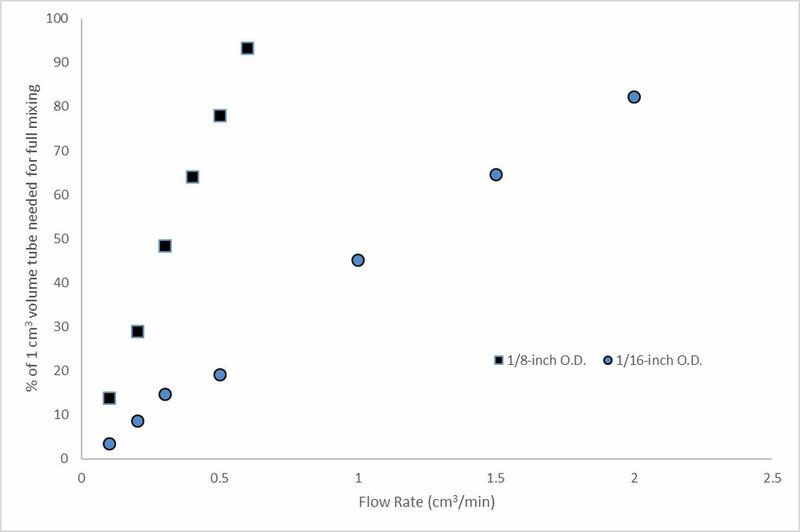 Taking these measurements and applying them to a 1 mL total volume coil reactor (50 cm for 1/8-inch tubing and 200 cm for 1/16-inch tubing), a plot of flow rate versus percent of the coil length needed for complete mixing was generated (Figure 4). As expected, a significantly higher fraction of the coil reactor length for the 1/8-inch O.D. (1/16-inch I.D.) tube is needed to achieve complete mixing at an equivalent residence time compared to the 1/16-inch O.D. (1/32-inch I.D.) tube. Sign up with your email address to receive Snapdragon Chemistry news and updates. © Snapdragon Chemistry, Inc. 2015. All rights reserved.